I have this special talent for finding and falling in love with expensive things. I have a knack for it, really- if you need someone to come with you to a store to pinpoint the most expensive item (with price tags hidden, of course), I am your girl. Strangely, I haven’t found much use for this gem of a talent. This draw to expensive things, however, does inspire many of our projects around here. I show Adam the copper light that I’ve fallen for that is $600 (not exaggerating) and we start brainstorming a way to make a copper light for less. Luckily, these OTTAVA pendant lights from IKEA have a great barn light-esque shape (and a $29.99 price tag… yep, that means that we spent $60 for both of our pendants! ), just minus the copper shimmer I was hoping for. 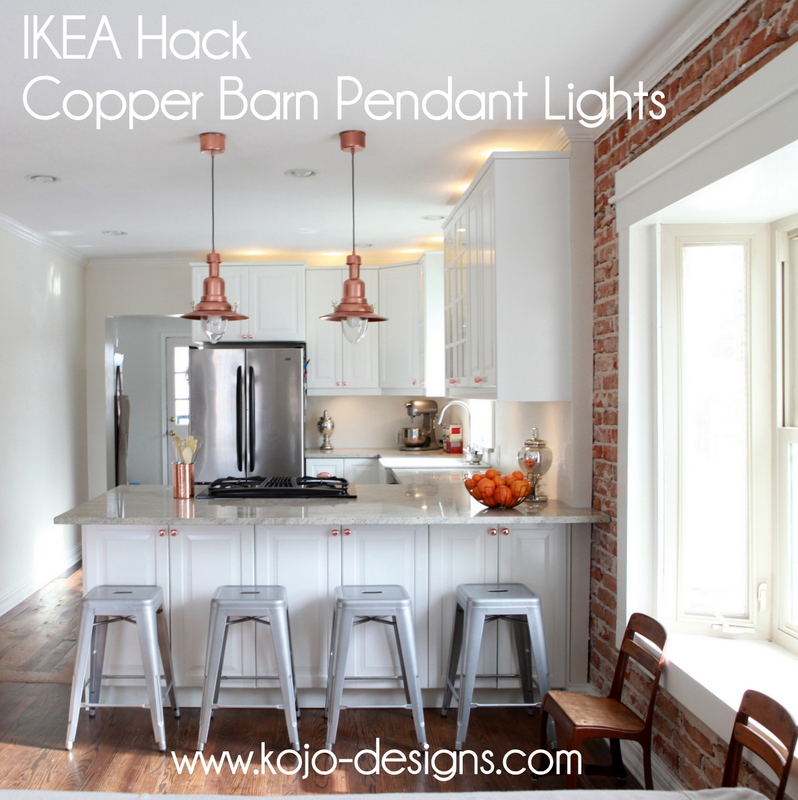 And so our copper barn light IKEA hack was born. And, bonus, this little IKEA hack is the perfect metallic addition to our current Winter Whites series! 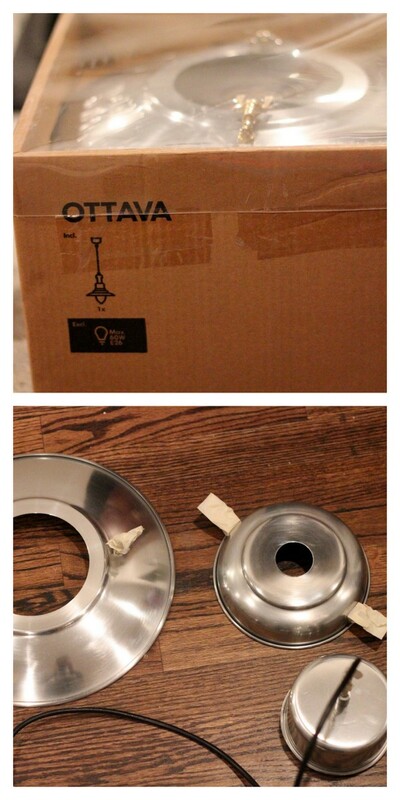 First get your OTTAVA light fixture out and separated into all of its parts. Using masking tape (or painters tape), cover all of the non-aluminum hardware. Similarly, tape off both the top and bottom 6″ of cord (so that the spray paint doesn’t splash onto the cord). We ended up buying (and using) both antique and shiny copper spray paint- we used the rustic paint as a base/primer and sprayed the shiny copper spray paint on top (allowing it to dry overnight betweeen coats). However, I’m not certain that the base coat is necessary- I think that a couple coats of the shiny paint would probably suffice (but, just so you know, the two-coats-in-different-finishes is what we did, and that worked too). Once all of the parts are sprayed (and allowed to dry for a day or two), reassemble and hang! That’s it. 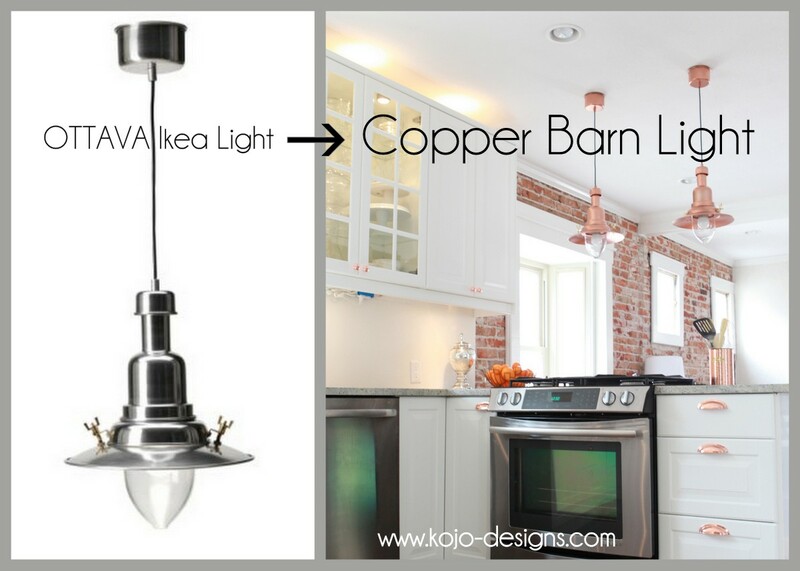 One shiny, copper-y, barn light for a kitchen near you! Or, go for broke (err, $30 more bucks) and make a pair. Lovely! 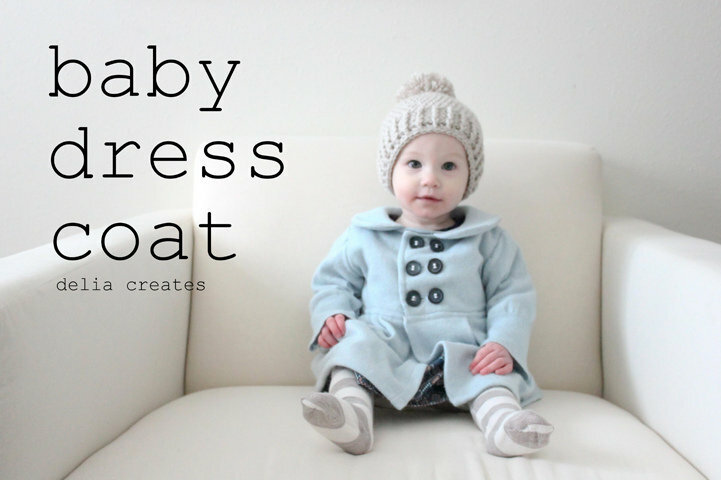 Be sure to check out more Winter Whites goodness (a supercute upcycled baby coat) over at Delia Creates! Hello how did you make or find the matching drawer knobs/pulls 🙂 I too have very expensive taste but this darn budget……. Haha- it’s the worst, right? Oh they are beautiful! I also love the color! Oh my. Girl, I admit: when I saw those lights in person, I just assumed hubby’s new job afforded some muy expensivo light fixtures. I cannot believe they are IKEA hacks. You would NEVER know it looking at them. They are gorgeous & the color is inspiring! You amaze me. you’re so funny, alicia! love it that your mom is maybe remodeling… too fun! That is so stinkin’ smart. I’ve been wanting to update our pendant lights, but I just figured it would be more money than I wanted to spend. Spraypaint and Ikea? Genius. Loving your bathroom updates, by the way! WOW! I just assumed you bought the lights that way. This just confirms my belief that you can pretty much transform anything with a can of spray paint and a little patience. Nice job! It’s so great what can be done with a little ol’ can o’ spray paint. I love classic copper in a kitchen, really pretty! I love your kitchen. The color scheme is fresh and new and I never thought to use copper accents. So fabulous!! The lights add just the right touch! I loved your comment about picking out THE most expensive things, I have always been accused of have champagne taste on a beer budget. It does allow for a lot of creativity though. I am not usually a fan of copper, it’s from growing up in the 60’s the whole copper and avacado thing… But I must say, the small touches you have put in look stunning and I really can’t picture anything else in their place, it goes perfect with the brick! Beautiful lights (and kitchen) Thanks so much for the IKEA heads up! Can you tell me where you found your bar stools? Awesome and love the copper pendants! Thanks Kim! I got the barstools on overstock (we love them!). I love these. I actually like yours much better! Thanks for the tip. 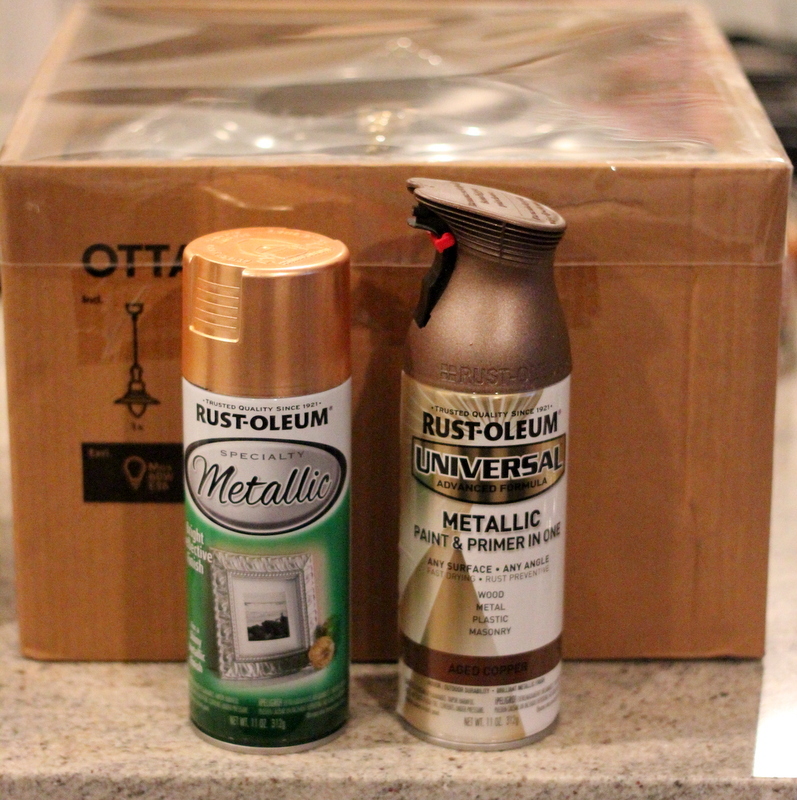 Rustoleum is my all-time favorite product! I’m such a low-prep gal and it does wonders. I love your lamp re-vamp. So awesome! Kirstin! This is awesome!! I’ve been spray painting light fixtures for many years, but I would’ve been scared to do copper and the lights for such a prominent place – yours turned out stunning! also, I have your same talent. never fails – the thing that I HAVE to have is five times more expensive than any alternative. Guess we probably shouldn’t ever go shopping together!! 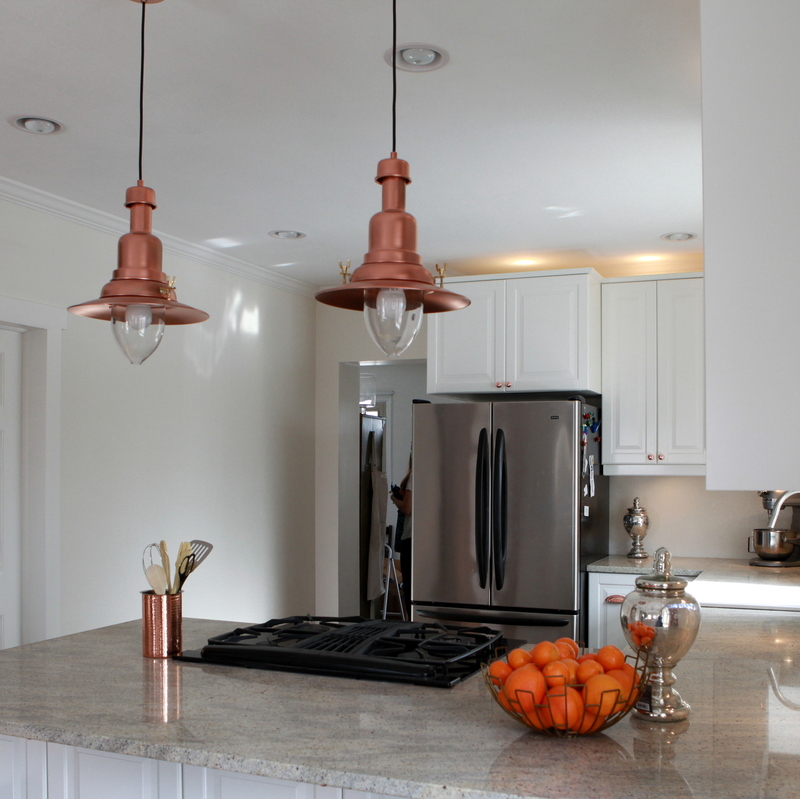 Love your copper colored lights and your kitchen too! The lights doesn’t look like it’s DIYed “looks expensive”. Great idea! Thanks for sharing Kirstin! Thanks so much Beckie! 🙂 Thanks for featuring us. FAB U LOUS and that brick interior wall–LOVE!!! I bought one of these (different style canopy) at a yard sale last summer for $5 and didn’t know where it came from. It’s missing one of the knurled nuts, which was replaced with a brass plain nut. Still trying to figure where it would go in an arts & crafts bungalow! Hey Debbie, is it going to be your only source of light? If so, I probably wouldn’t recommend them (they aren’t super bright). They’re perfect when paired with another light source, though (we have recessed lighting in the kitchen as well). 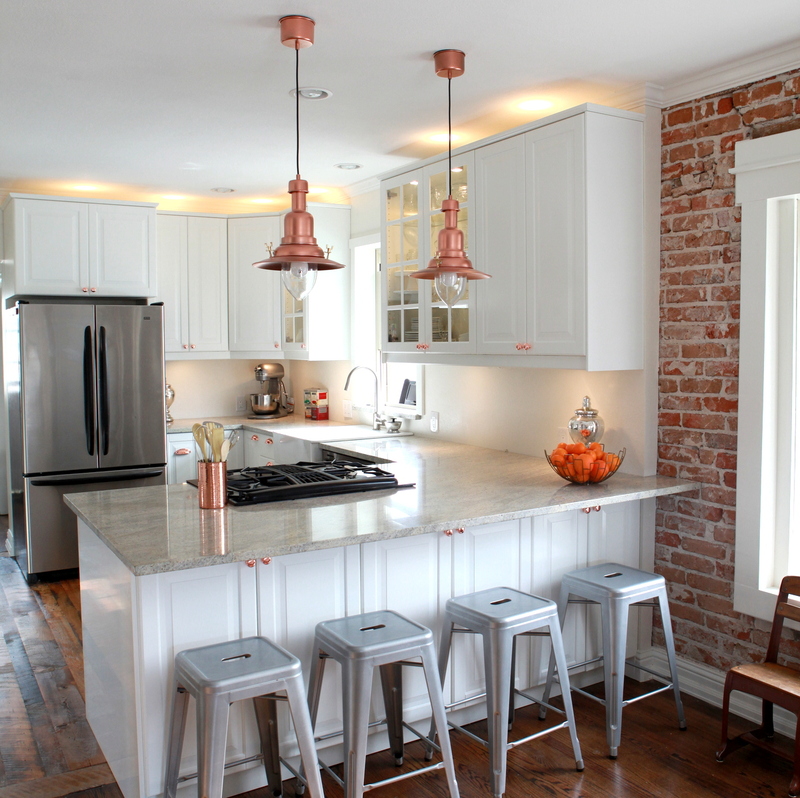 I absolutely love the kitchen, and I love the copper details. I was wondering where you bought the copper drawer pulls and knobs from? I couldn’t help but notice the floors in your kitchen…can you tell me about them!??! Ugh I’m not nearly crafty enough for this! Wish I could just buy them in this colour! Haha- that’d be nice right Jo? Isis- it sounds like we have similar design taste! Good luck on your remodel! Sounds like it’s going to be gorgeous! I know this is an older post but I had to ask how the paint finish held up on these lights. I looooooove them. We have very similar colours in our kitchen and I am currently searching for knobs but so far nada. I want square copper knobs. Hey Veronica! We only lived in that house for 2 years, but the paint held up great for that time… Hope that helps! 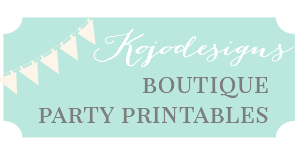 Just stumbled across your blog (& love it!) from Pinterest. Question for you – is your brick wall ACTUALLY a brick wall or is it wallpaper? If it’s paper, would you mind sharing where you got it from?! Thanks! Corinne- we moved overseas this summer and I am always amazed at how much more we pay for things here than I did in Denver. Ugh! It’s the worst, right?